This view of the gamma-ray sky constructed from one year of Fermi LAT observations is the best view of the extreme universe to date. The map shows the rate at which the LAT detects gamma rays with energies above 300 million electron volts -- about 120 million times the energy of visible light -- from different sky directions. Brighter colors equal higher rates. During its first year of operation, NASA's Fermi Gamma RaySpace Telescope found new, unexpected sources of the highest energy of lightand showed that Einstein was right about the speed of light. Fermi is a new observatory launched last year that looks forgamma rays, created by some of the most violent explosions in the universe. Some of these observations have given scientists moreinsight into Einstein's theories of relativity by showing effects ofhigh-energy light that can't be replicated in a lab. "Physicists would like to replace Einstein's vision ofgravity ? as expressed in his relativity theories ? with something that handlesall fundamental forces," said Peter Michelson, principal investigator ofFermi's Large Area Telescope, or LAT, at Stanford University in Palo Alto, Calif. "There are many ideas, but few ways to test them." Many approaches to new theories of gravity picturespace-time as having a shifting, frothy structure at physical scales trillionsof times smaller than an electron. Some models predict that the foamy aspect ofspace-time will cause higher-energy gamma rays to move slightly more slowlythan photons at lower energies. Such a model would violate Einstein's edict that allelectromagnetic radiation ? radio waves, infrared, visible light, X-rays andgamma rays ? travels through a vacuum at the same speed ?the speed of light. On May 10, 2009, Fermi and other satellites detected aso-called short gamma ray burst, designated GRB 090510. (Astronomers think thistype of explosion happens when neutron stars collide.) Ground-based studiesshow the event took place in a galaxy 7.3 billion light-years away. Of the many gamma ray photons Fermi's LAT detected from the2.1-second burst, two possessed energies differing by a million times. Yetafter traveling some seven billion years, the pair arrived just nine-tenths ofa second apart. "This measurement eliminates any approach to a newtheory of gravity that predicts a strong energy-dependent change in the speedof light," Michelson said. "To one part in 100 million billion, thesetwo photons traveled at the same speed. Einstein still rules." 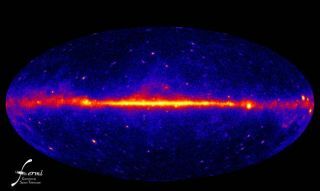 Fermi's secondary instrument, the Gamma ray Burst Monitor,has observed low-energy gamma rays from more than 250 bursts. The LAT observed12 of these bursts at higher energy, revealing three record setting blasts. GRB 090510 displayed the fastest observed motions, withejected matter moving at 99.99995 percent of light speed. The highest energygamma ray yet seen from a burst ? 33.4 billion electron volts or about 13billion times the energy of visible light ? came from September's GRB 090902B.Last year's GRB 080916C produced the greatest total energy, equivalent to 9,000typical supernovas. Scanning the entire sky every three hours, the LAT is givingFermi scientists an increasingly detailed look at the extreme universe. "We've discovered more than a thousand persistent gammaray sources ? five times the number previously known," , said Julie McEnery,Fermi project scientist at NASA?s Goddard Space Flight Center in Greenbelt, Md. "And we've associated nearly half of them with objects known at otherwavelengths." Blazars ? distant galaxies whose massive black holes emitfast-moving jets of matter toward us ? are by far the most prevalent source,now numbering more than 500. In our own galaxy, gamma ray sources include 46pulsars and two binary star systems where a neutron star rapidly orbits a hot,young star. The discoveries of Fermi's first year of observations aredetailed in the Oct. 29 issue of the journal Nature.